I’ve seen this idea on a couple of blogs before and I thought I’d love to create my own series of remix posts where I show you all the different ways I’ve styled an item. I’ve wanted to start this for a long time but I was waiting until I built up at least four different outfit posts with the same item; I know I’m not very creative with my styling and I never use my wardrobe to its full potential, so these posts may not be too frequent for the time being. I thought it would be appropriate to start with my red Alannah Hill cardigan which I bought at the beginning of the year. It has been a winter staple and the sort of item I can always rely on when I dont know what to wear.It is so versatile and I could probably wear it with almost every skirt, pair of jeans and dress in my wardrobe. I love the little detailing with the ruffles and the sparkly buttons. I adore how bright and vibrant it is; it really makes an outfit stand out. I spent a lot of money on this cardigan; it is one of the more expensive Alannah Hill items I’ve ever bought so it’s great that I’ve had so much use out of it. This entry was posted in Remix. Bookmark the permalink. Let's see more of these posts! 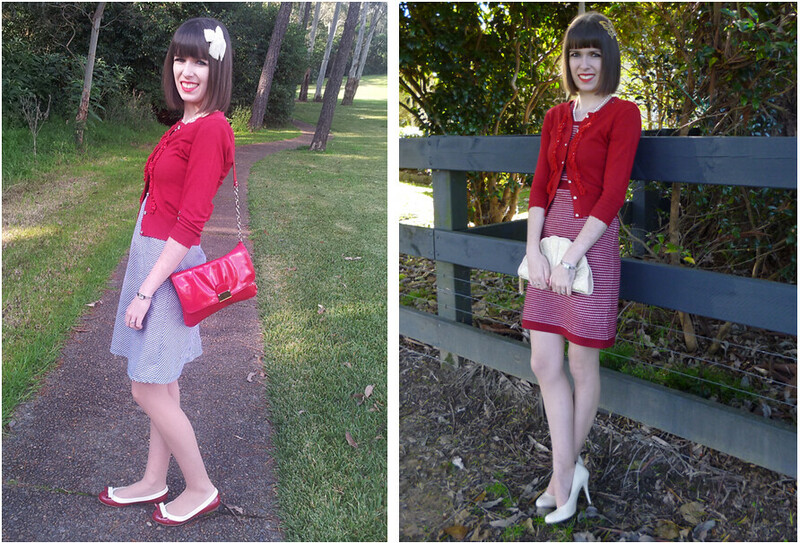 I had noticed your pretty Alannah Hill cardigan in the previous posts (along with your hair, lipstick and hair-bows). It coordinated nicely with the different skirts and dresses. It will be interesting to see what fashion picks make their way into your future remix posts as the warmer Spring and Summer weather arrive. Have a wonderful (and more cheery) Spring and Summer, and best wishes for conquering any stress you encounter. This is such a great idea for a post. I love the cardigan with the white dress. Such a versatile little cardi, it looks great with all the looks. You have the sweetest clothes I always get jealous of your wardrobe. Have a good week. Hooray for a remix post! I love these kinds of posts. Your red cardigan is wonderful. I really love the ruffled detail on it too. I would be wearing it with everything if I owned it! 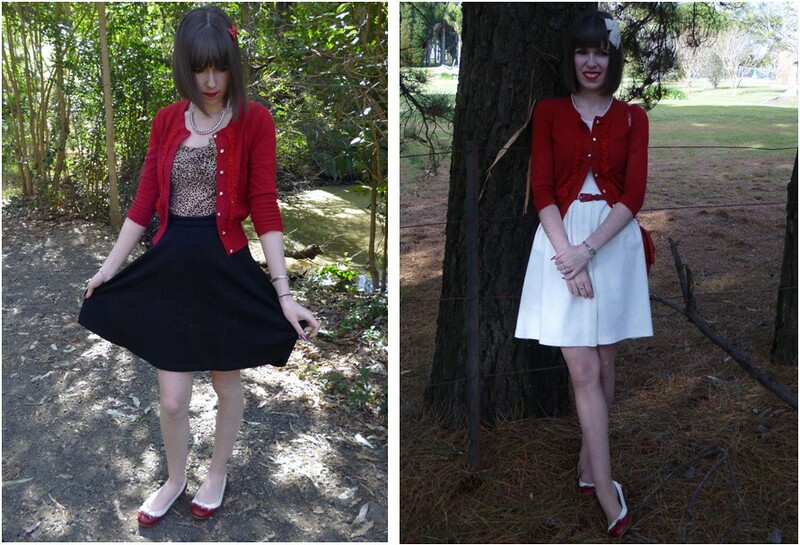 Such great outfits with that adorable red cardigan. Great remix!! I've just found your blog, is really cute! Now I follow you with GFC, if you want follow me back! You and your cardigans — LOVE. I think we need to combine cardigan collections. Can you imagine the greatness?? I like this cardigan a lot! Totally awesome use of the cardigan! You have a nice way of styling each look! You can never go wrong with a red cardigan! The shell shaped clutch purse is to die for in the last pic! Join Estée Lauder Giveaway 🙂 it is international! The cardi is very cute. I actually really like the red on red look.